As a parent, you’re responsible for ensuring that your kids have a good childhood. This not only means providing a safe place for them to grow up and access to an education, but ensuring that they have good experiences that help them become better people. We’re here to tell you that playing octaball (aka gaga ball) is a great way to do just that. You may wonder, “What does a silly backyard game have to do with my kids finding success in life?” Good question. Although the two may seem unrelated, we believe that they’re two sides of the same coin. The skills that children can learn by playing informal games of gaga ball can enhance their performance in organized sports like football, baseball, and basketball. And it’s already been proven that the skills gained in those sports, both physical and mental, can enhance a child’s life for many years to come. Let’s take a look at some of things your kids will learn while playing gaga ball that will amplify their performance elsewhere, both on the field or court, and in the classroom! Eye-Hand Coordination – You only have to watch a group of kids play gaga ball for a few minutes to understand that a lot of eye-hand coordination is required to win the game! Players are required to strike, swat, and roll the ball at their opponents with the hopes of hitting them below the waist. In order to swat or strike with accuracy, your hand has to send the ball where your eyes are looking! Eye hand coordination comes in handy in almost every organized sport you can think of so this provides great practice for your kids. Jumping and Dodging – In order to avoid being struck by the ball that’s being swatted or rolled by the other players, your child will have to jump, spin, duck, dodge, and possibly even dive to get out of the way! These movements encourage increased flexibility, agility, and speed–all skills that are highly prized in sports like basketball, baseball, and football. Playing The Angles – I’ll bet you didn’t think we would have an opportunity to talk about math in an article like this, but here we are! A big part of gaga ball is playing the angles, which means finding a way to throw or roll the ball at one of the Octopit’s eight walls in such a way that it rebounds into the legs of an opponent. In much of the same way that playing billiards exposes players to the power of geometry, playing gaga ball will teach your child your child to look for and take advantage of angles in other sports! These are just a few of the physical and mental skills that playing gaga ball will help your child to perfect. We hope that you’ll consider ordering an Octopit for your yard so that your kids can enjoy these benefits for themselves. 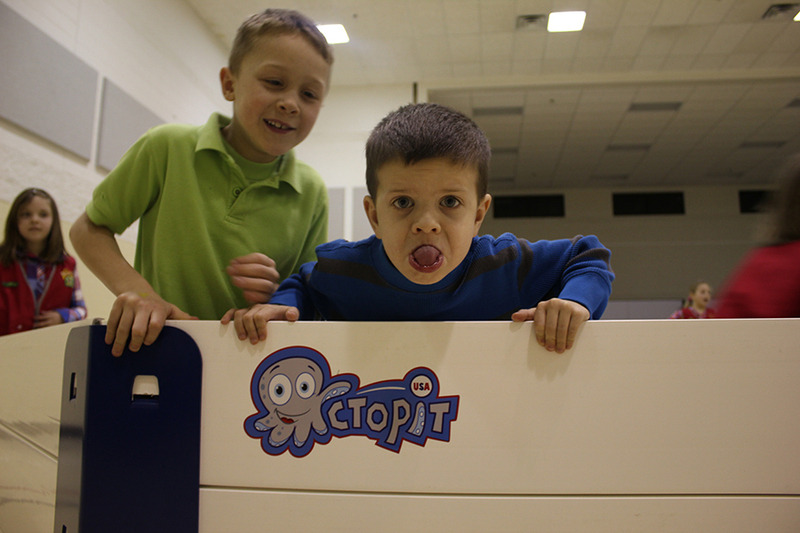 We’re fully confident that providing an Octopit will encourage your children to give gaga games a try, and eventually the entire neighborhood will be clamoring to play!